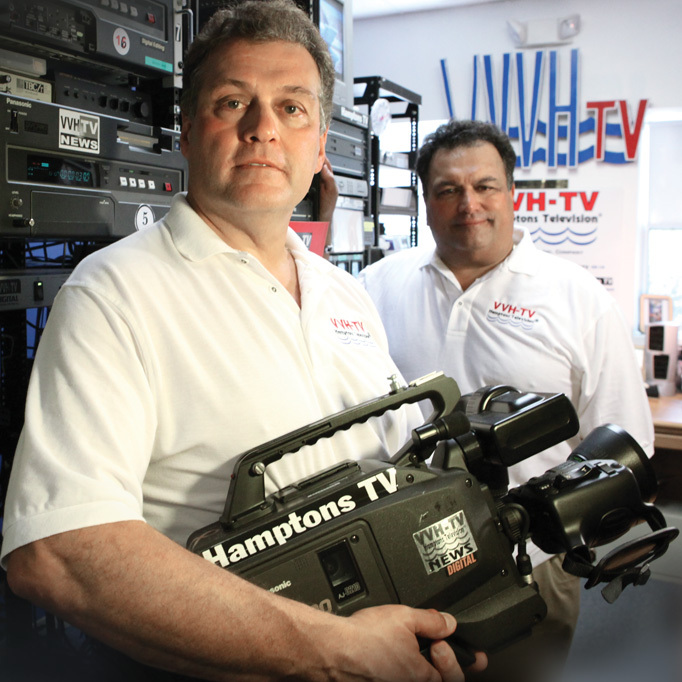 WVVH-TV, Hamptons TV® is the largest FCC licensed TV station in Suffolk County New York, broadcasting on UHF Channel 50, Optimum 78, Verizon FiOS Channel 14 and YouTUBE broadcast TV partner. Hamptons TV® is seen throughout New York Tri state Area and worldwide on our 24/7 webstream www.wvvh.tv WVVH-TV is the official TV station for the Hampton Classic Horse Show and Hamptons International Film Festival; the State designated Emergency Broadcast TV station for Amber Alerts and National Hurricane alert. WVVH-TV serve the needs of our communities every day, by providing relevant local news, emergency alerts, weather, public safety issues, educational Public Service Announcements and important government information. We also supply local service organizations with special coverage that is proven to substantially increase community awareness. We are the New York State Broadcast Association Winner for Best Children's Programming. Growing Viewers Everyday Since 1994! Remember those kids from the neighborhood, the “Little Rascal” types always rehearsing skits and hanging linens for stage curtains and sticking tutus on puppies? The stars-in-their-eyes dreamers - Alfalfa meets Bob Fosse - so eager to recreate Broadway in their backyard? They grew up to be Greg and Ernie Schimizzi. The Schimizzi story is the perfect parable for television’s evolution, a movie-of-the-week abridgement of the medium’s history. Like TV itself, Wainscott-based WVVH has grown from a local curiosity to a global presence. It’s even become a pawn in the turf war between Verizon’s FiOS Network and the masterminds at Cablevision (stay tuned). Everything from a violated car-security patent to the Internet to old-school “Our Gang” chutzpah has played a part. And behind it all: two wordsmiths, shutterbugs and slightly geeky technophiles who still get jazzed about putting on a show. In 1994, the FCC offered the last license for a Long Island broadcast station - Southampton’s UHF 23. There was no actual station, Greg Schimizzi recalled, just a permit to build one, but the brothers swooped in. Nearly two decades in the film industry had primed them for the challenge, and WVVH was the ideal extension of the brothers’ personal and professional relationship. For the spunky siblings, products of Dad’s mechanical mind and Mom’s eye for detail, success required innovation. In 1971, noticing a trend in their Bensonhurst stomping grounds (crooks burgling car trunks by jimmying locks with screwdrivers), the then 20-something brothers invented a lock-shielding antitheft device. In 1972, deeply in love with American history, they coauthored and published “September 11, 1776: America’s First Attempt at Peace,” chronicling an actual meeting at Staten Island’s Billop Manor House between congressional delegates Ben Franklin and John Adams and Admiral Lord Richard Howe, commander of the British Navy. And in 1977, they collaborated on Video Voice Inc., a Manhattan-based film production and distribution company that owed as much to the Chrysler Corp. as to the duo’s creative moxie: The Schimizzis’ antitheft device was patented and never licensed - but suddenly there it was, affixed to new Chryslers. They sued Chrysler for patent infringement, and “that victory helped us start Video Voice,” Ernie said. License in hand, the brothers had one year to build a transmitter and acquire and schedule programming. When Channel 23 debuted in 1995, the first thing viewers saw was a simulcast of CNN Headline News; WVVH, a 24/7 venture from the start, also became Eastern Long Island’s home of Bloomberg TV. About a year later, Channel 23 hit its stride. Along with the simulcasts and a growing assortment of children’s programming and local sports, the Schimizzis offered extensive coverage of the annual Hamptons Classic Horse Show. At first, they inserted canned footage (”Hamptons Classic Moments”) into their CNN blocks, 10 minutes at a time. But the Classic coverage proved popular, and soon more of WVVH’s resources were dedicated to the annual event - including the installation of a fiber-optic connection from the Bridgehampton show grounds to the station’s Wainscott studio. Among those noticing: Cablevision, which in 1996 added WVVH to basic packages on its Riverhead and East End systems. Just two years after the Schimizzis snagged their FCC license, Channel 23 was a hit. Much has changed in the 14 years since Cablevision called. WVVH (Cablevision Channel 78) has dropped CNN and Bloomberg, promoting instead a combination of home-grown and syndicated content centered on dynamic lifestyles. The station purchases content from Portland, Maine-based Outside Television, a national network dedicated to active-lifestyle content (e.g. surfing and rock-climbing). Since 2000, WVVH has also been the only New York affiliate for America One, a national alternative-sports provider offering disparate entertainment like rugby and professional wrestling. WVVH also simulcasts about 25 minutes of Independent News Network content every weeknight, and is celebrating two years as the New York affiliate for “The Daily Buzz,” a nationally syndicated morning talk show out of Orlando, Fla. The Schimizzis often splice local content into the “Buzz” block, including remote reports on the now-legendary Montauk Monster and recent segments featuring a Hamptons pharmacist discussing sunburn, poison ivy and other summer dangers. But the biggest change is who watches WVVH, and how. After several fruitless attempts to expand their Cablevision coverage west of Riverhead, the Schimizzi brothers, true to form, did it themselves. Recalling their old Heathkit electronics set (they couldn’t afford a color TV as kids, so they built one), the brothers set out in 2004 to stake a digital claim. With the flip of a metaphorical switch, WVVH was global. And when Verizon rolled its FiOS fiber-optic network on Long Island in 2006, it immediately contacted the Schimizzis. The Verizon spokesman insisted that transmitting WVVH beyond Eastern Long Island wasn’t a shot across Cablevision’s bow, but “a matter of providing good local programming for customers.” The Schimizzis, meanwhile, don’t necessarily see themselves as a pawn in the FiOS/Cablevision smackdown - but don’t mind if they are. However its audience tunes in, business is booming at WVVH. The station employs four full-timers and a slew of freelance reporters, producers and engineers. It’s expanding its coverage of regional events (including film festivals in the Hamptons and Nassau); and it’s “working on” high-definition broadcasts, according to Ernie. Meanwhile, advertising revenue is up - local restaurants, banks and hotels are still buying time, while WVVH draws continued attention from regional advertisers like Jaguar and Mercedes. And for the natural-born storytellers who learned to develop their own photos as youngsters, running a TV station will always be a blast. You’re our neighbor and many of you are our friends. We’ve enjoyed 15 years of award-winning excellence on Long Island and we want to share our success with you. Our goal is to provide affordable, realistic and effective TV advertising solutions that help you reach and direct your clients and shoppers on TV or online. It’s a whole new world! Hamptons Television® is an independent broadcast station with general and family entertainment. It’s an affiliate of Outside TV and YOUTOO networks. HTV serves the community with relevant local news, emergency alerts, weather, public safety issues, as well as educational Public Service Announcements and important government information. We supply local service organizations with special coverage proven to substantially increase community awareness. New York State Broadcast Association Winner for Best Children's Programming. We’re Growing and Growing! Montauk to Manhattan, Westchester Significant expansion deep into the NY Market and Tri-State area delivers your advertising message to an estimated millions TV viewers plus additional online viewers around the world. * Gain powerful TV exposure with the largest and most watched station in Suffolk. The fast-merging media of TV and the Internet compel advertisers to be innovative or fall behind. At Hamptons Television®, we’ve got your back! Long Islanders examine vital issues with Chief Investigative Reporter Karl Grossman, professor of journalism at SUNY College at Old Westbury, and founder and first president of the Press Club of Long Island. Sponsorship opportunities are available for businesses that want the benefits of branding with a news program.